Over at the Internet Archive, you can find George Orwell's classic, 1984, available as a free audio book. As you'll see, the recording is professionally done. You can download the full zip file here. Or alternatively you can get the individual mp3 files, or stream them, from this page. 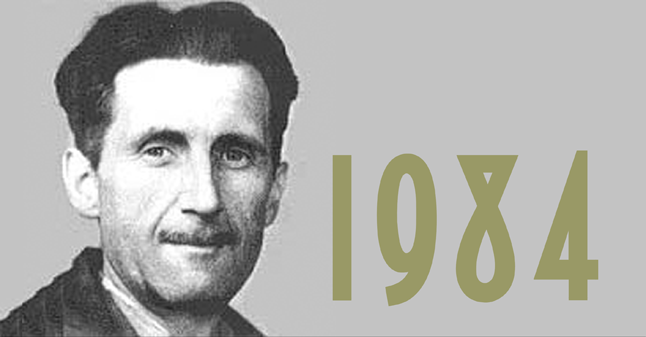 On a more permanent basis, you can find Orwell's 1949 work housed in our Free Audio Book Collection along with lots of other free texts. Here, you will also find Orwell's other major classic, Animal Farm. Note: Looking for an easy way to download Orwell's classics, or any other audio book, for free? Just head over to Audible.com and register for a 14-day free trial. You can download any audio book for free. Then, when the trial is over, you can continue your Audible subscription (as I did), or cancel it, and still keep the audio book. The choice is entirely yours. Glad to finally have a good audiobook copy of 1984. I’ve got the book, I’ve got the movie, and now I’ve got the audiobook. Thanks for linking to this! Thanks so much!!!! I love this book, read it in high school, and now am reading it again in college…. since I don’t have a lot of time to devote to reading it… i though I might as well listen to it while I run! how the hell do you download this ? Where is the download link? And how do i download it? Does anyone know if this goes directly to itunes, is abridged, or doesn’t come in order? Lol. I need to read this book for school and I would like to listen to it on tape. BTW…I have A Macbook Pro. Does this function on Mac? kaka douna says . . . In what way is it American? It should have been required reading for the U.S., since it is largely too late for everyone else. Too late for us, too. Still, good reading to help understand what leaders have been doing for quite a while. one of the most influential book of all times! Is it British or American english? don’t want to waste the free download chance on some american-spoken book. Lego’s Star Wars Clone Wars includes 20 missions based on unceremonious stories, placate and characters with 40 tip levels covering the whole epoch of the Clone Wars…. Once I download the Zip, how the, do I get it onto itunes? then on itunes you click, FILE>>IMPORT FOLDER FROM LIBRARY, and then browse for the folder. How come you can give this audio book away for free when it is not in the public domain yet?